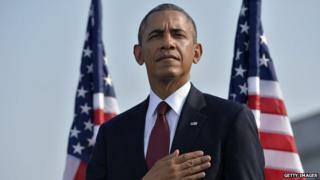 A Point of View: Is the US president an elected monarch? President Obama has been accused of acting like a monarch. But the US presidency has been an elected kingship since 1776 in all but name, argues the historian David Cannadine. After five weeks of campaigning, which may have seemed unending and interminable at the time, but which in retrospect passed relatively quickly, the British general election is over, and David Cameron is once again ensconced in 10 Downing Street. But although the votes will not be cast until November 2016, the battle for the American Presidency has already begun, as several Republicans and Democrats, with varying degrees of plausibility, have recently declared themselves as candidates for their party's nomination. Yet there are 18 months to go until that election, and Barack Obama will not actually vacate the White House until his successor is inaugurated in Washington DC in January 2017. This is, to put it mildly, a much longer period of campaigning than that which characterises British elections, and it's often observed that the abilities required to win the long-distance race for the American Presidency are very different from those that are subsequently needed to govern the country from the Oval Office. There are, no doubt, many reasons why Americans spend so much longer choosing their next president than we spend in deciding upon our next prime minister. But one explanation might be that, whereas in Britain we are merely settling on the next head of government, Americans are not only doing that, but they are also, and in the same person, selecting their head of state as well. But what sort of a presidency is it that, unlike many of those existing in Western Europe, combines these two jobs? According to some of Barack Obama's Republican opponents he has not been doing the job the way it should be done. Last November, for example, when Obama sought to shield millions of undocumented immigrants from deportation by issuing an executive order allowing them legally to remain in the United States, he was denounced by his critics for exceeding his legitimate constitutional authority. Yet Barack Obama is far from being the first American president who has been accused by his opponents of behaving like a sovereign of the European old regime, or as an oriental despot lording it, unchecked and unrestrained, over his subservient subjects. For such criticism of assertive and determined American presidents, whether Democrat or Republican, for their regal presumptions and monarchical pretension is almost as old as the American republic itself. During the 1830s, when Andrew Jackson occupied the White House, some Americans became increasingly worried about the growth of executive power centred on the President, and there were critical cartoons of King Andrew the First, who was caricatured as being clad in royal garb, and with the royal veto in his hand. During the American Civil War, when Abraham Lincoln was the strongest and most decisive President since Jackson, criticism resurfaced that he, in turn, was acting too much like a king. And these concerns re-emerged in the early 20th Century, during the presidency of Theodore Roosevelt. He was the most upper class American leader since Thomas Jefferson - through his mother he could boast the blood of the Royal house of Scotland pulsing through his veins. He expanded and aggrandized his office by exploiting the potential of what he called its "bully pulpit", and as an exponent and practitioner of American imperialism, he was eager to take up the "white man's burden", as Rudyard Kipling exhorted him to do. And it was in wary recognition of such peremptory behaviour that the novelist Henry James suggested that the President's initials, TR, did not so much stand for Theodore Roosevelt but rather for Theodore Rex. TR's distant cousin and eventual successor, Franklin Delano Roosevelt, was no less kingly a president. He possessed a powerful sense of dynastic identity, taking another relative, Eleanor, to be his wife. Having first been elected president in November 1932, he would be re-elected three more times, which was not only unprecedented in American history, but also meant that FDR effectively held the job for life, dying at his post in April 1945. During the heady years of the New Deal, when he attacked the bankers and big business, Roosevelt was regularly denounced as a traitor to his class, as a communist or as a fascist dictator, or as a another president of unconstitutionally regal ambitions. And FDR genuinely seems to have enjoyed meeting such crowned heads of state as King George VI of Britain, and the deposed Emperor Haile Selassie of Ethiopia, monarchs whom he regarded, in Roy Jenkins's vivid and delightfully oxymoronic phrase, as "slightly inferior equals". So there's nothing new in the recent denunciations of Barack Obama as a president misguidedly behaving as a king or as an emperor. And such criticisms, whatever their merit, are scarcely surprising, for the American nation was brought into being on the basis of extravagant and exaggerated monarchical denunciation. According to the Declaration of Independence, King George III's reign was characterised by "repeated injuries and usurpations". Among other things, he'd obstructed the administration of justice, refused to assent to laws "the most wholesome and necessary for the public good", and had "plundered our seas, ravaged our coasts, and burnt our towns". He was, the Declaration concluded, "a prince whose character is thus marked by every act which may define a tyrant", which meant he was "unfit to be the ruler of a free people". Small wonder that at the constitutional convention, which met in the aftermath of the War of Independence, the delegates agreed that America's new head of state should be an elected president rather than an hereditary monarch. "Speak softly and carry a big stick; you will go far" "The only thing we have to fear is fear itself"
But this was far from being the whole of the story. To begin with, the denunciation - and the demonisation - of King George III in the Declaration of Independence was based on a seriously misleading exaggeration of his royal prerogatives. Those powers were increasingly being claimed by the politicians, and insofar as George III did re-affirm Britain's right to rule, to tax and to legislate for the American colonies, he believed he was asserting the sovereignty of the British parliament rather than that of the British crown. But ironically, when the leaders of the American Revolution tried to work out what powers they should give to the newly created American presidency, the only models available were those of contemporary European monarchies, and especially the British. And so the founding fathers gave to the American presidency just those powers they erroneously believed King George III still possessed - to appoint and dismiss his cabinet, to make war and peace, and to veto bills sent up by the legislature. From the outset, then, the American presidency was vested with what might be termed monarchical authority, which meant that it really was a form of elective kingship. So when Henry Clay, the leader of the American Whig Party regretted that, under Andrew Jackson, the presidency was "rapidly tending towards an elective monarchy", he was in error because it had been an elective monarchy from the very beginning. Image caption King George III - a tyrant? Indeed, better-informed Americans fully understood this. "We elect a king for four years", Abraham Lincoln's Secretary of State once observed, "and give him absolute power within certain limits, which after all he can interpret for himself". Some commentators went even further, insisting that although America claimed to be a republic, because it had no hereditary sovereign, it was in reality a disguised monarchy - whereas Britain might claim to be a monarchy, because it had a royal head of state, but it was in fact a concealed republic, because the politicians rather than the sovereign were actually in charge. In the words of one late 19th Century American newspaper: "Great Britain is a republic, with a hereditary president, while the United States is a monarchy with an elective king." That may not have been the whole truth of things then, and it is not the whole truth of things now, but it should certainly give both President Obama, and also his Republican critics, some food for thought - to say nothing of the occupants of 10 Downing Street and of Buckingham Palace.